Town midfielder Andrew Shinnie knows his side can’t dwell on their magnificent 8-2 victory over Yeovil when they take to the field against Barnet this afternoon. The Hatters rocketed to the top of the table with a stunning display against the Glovers last weekend and now head to the Hive to take on a Bees side who drew 2-2 at Forest Green Rovers. It’s a good statement to put out that we’re ready for the league this year. Shinnie knows their opening day heroics have now long gone, as he said: “We spoke about that, it’s a good start but that’s all it is. “It could have been 1-0, and still three points on the board. It’s a good statement to put out that we’re ready for the league this year. “The lads that were here have last year behind them now, it’s a big year for us so it was important to put out that statement. “That’s what we said when we went 5-1 up, we still weren’t happy at half time, lets not take our foot off the pedal, lets keep going. Midfielder Alan McCormack was of the same opinion too, as he said: “In nine months time, if we’re still putting that performance in with three or four games to go, then you’d be expecting to get carried away, but no league is ever won on the first game. “It’s dead and buried now, we’ve got a game next week that’s our priority. “We can look at our video clips during the weekend and analyse our little mistakes, or little positioning play we can work on, but we’ll work as your next game is your most important game now. “That’s the standard that’s been set around the training ground, around the dressing room, on the football pitch, be the best you can be and if you’re not the best, the gaffer’s not going to let you get away with it and the players aren’t going to let you get away with it. “So the standard is there, everyone knows where they need to be and what performance they need to put in and for me that’s what can win you the league and what can get you promoted. “That is the aim this season for Luton Town and the players in the dressing room. Striker James Collins echoed his team-mates thoughts too, saying: “We can enjoy all the plaudits we’re getting, but then going away in this league is not easy. Meanwhile, on the eye-catching result from last weekend, Shinnie continued: “It was a bit of a strange one, I don’t know if I’ve been part of something like that. “We started well, should have been up 1-0, then they get a free kick and you just think he’s going to score here and he did. “But we didn’t let it alter our performance, we just kept banging at the door and it was just pure clinical, every chance. Although Luton were beaten 2-0 on home soil by Ipswich in the Carabao Cup on Tuesday night, Shinnie didn’t think there was much wrong with the hosts display. He added: “It was a good performance, maybe the clinical-ness we had on Saturday was just a little bit missing on Tuesday. 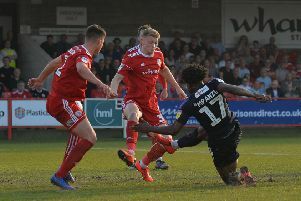 “If we had that we probably could have won the game, as we more than matched them I thought and Elliot (Lee) had a decent chance, which came back at him quite quickly from the goalie. “If we’d knocked that in, and got level and came back out, you never know what could have happened. “But Ipswich grew into the game a little bit as it went on and they’re obviously a good side.